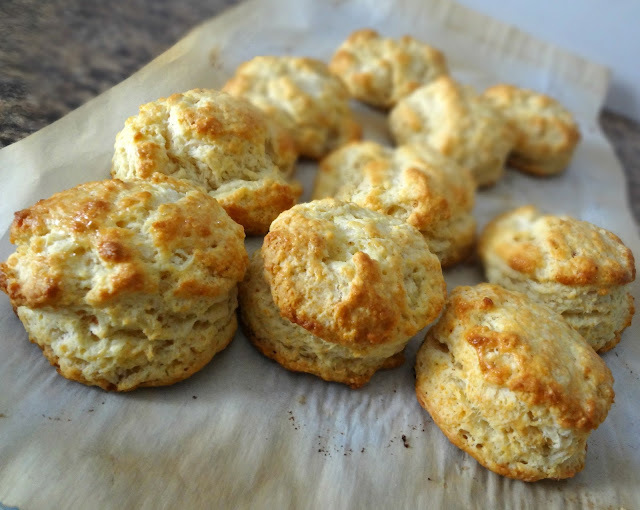 From A Cozy Kitchen's "Brown Butter Buttermilk Biscuits"
In a small saucepan, melt 1/2 stick of butter over medium-low heat. Stir continuously as it melts, foams, then browns. (You'll know it's browned when you can see little brown specks form). Remove from heat and allow to cool to room temperature. In a large bowl, mix flour, baking powder and soda, and salt. Cut 1 stick, cold, butter into cubes. With hands, quickly work the butter into the dry ingredients until the pieces resemble small peas. In a measuring cup, whisk buttermilk and egg. Add brown butter (use a rubber spatula to get all the brown butter speck-goodness from the pan) and whisk into the milk/egg. 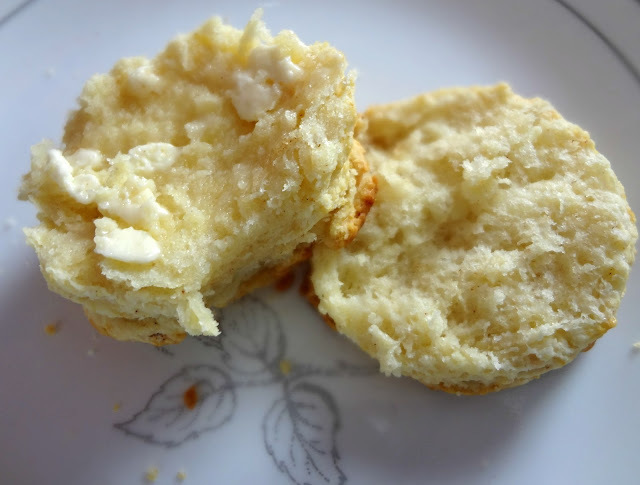 (You do this this way so when the brown butter mixes into the cold milk and egg, it solidifies into tiny little brown butter pieces, which is a good thing for biscuits). Pour liquid into the flour mixture and mix until barely combined. Knead on a lightly floured surface 4-5 times. Press dough into 1 in. thickness. Cut using a 2-in. biscuit cutter (or...if you're me...a 2-in. top of a cup)-you should make approx. 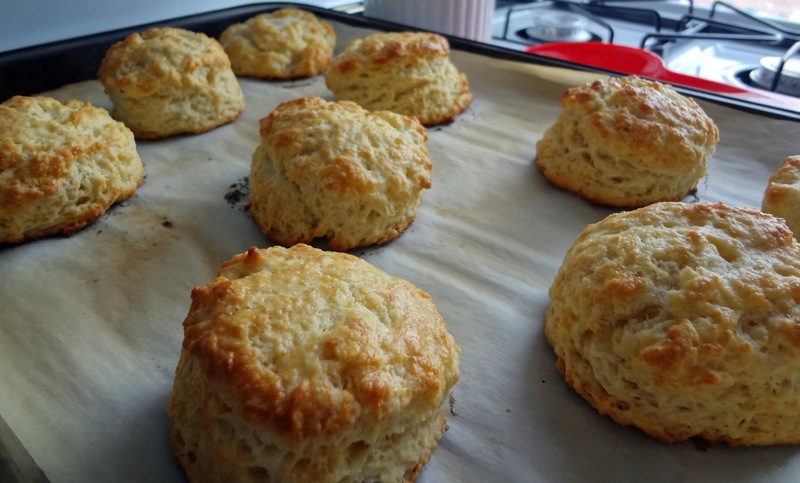 7-10 biscuits. May have to recombine scraps and cut again. Transfer to a parchment/silpat lined baking sheet. If moving slow, and you want to make sure the dough is still chilled, stick in freezer 2-3 minutes. 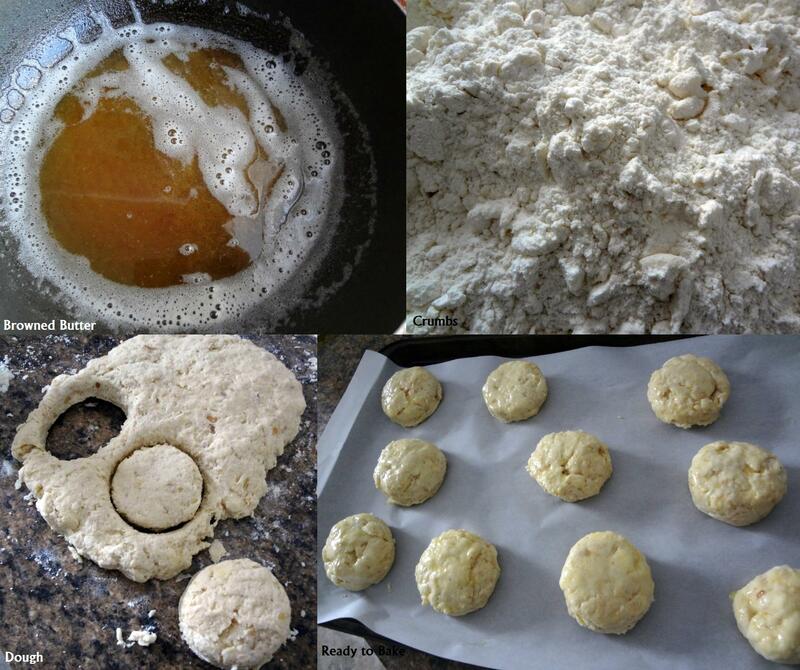 Brush tops of biscuit dough with egg wash.
Bake 15-20 minutes until tall and golden brown. Stay tuned for guest posts on Wednesday, for an amazing pasta dish, and on Friday, for a 4th of July themed "refreshing" (and healthy-ish) dessert!